I have become a strawberry ice cream convert in my adulthood. When I was a kid, I didn’t want to be anywhere near the stuff. I’ve always adored strawberries, but for some reason strawberry ice cream couldn’t have been more vile to me. The worst possible thing was when I would be at someone else’s house and a carton of Neapolitan ice cream appeared. Vanilla? Good. Chocolate? Good. Strawberry? Bleh. And I felt like it contaminated both of the others. God forbid a drop of strawberry touched one of the other two. I wouldn’t eat the entire bowl. What was wrong with me?? Maybe I had never had really good strawberry ice cream. Maybe my palate had yet to mature. Well, now I’m all grown up and I’m here to tell you that this fresh strawberry ice cream is most definitely one of the best things you can make this summer. 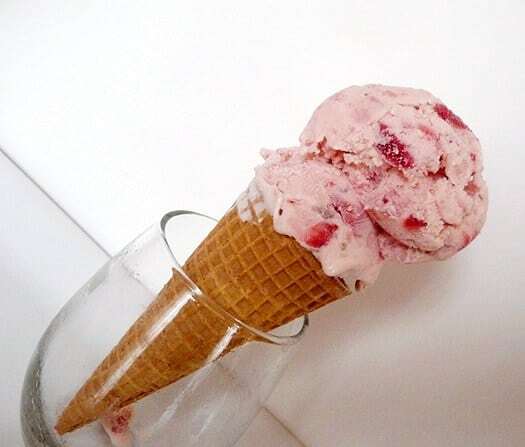 I love this strawberry ice cream in a waffle or sugar cone. 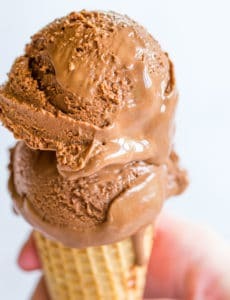 Something about the contrast between the fresh sweetness of the ice cream and the crunch of those types of cones just seems like a perfect match to me. 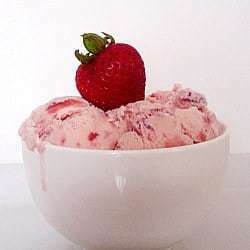 I used a whole quart of strawberries for this recipe, which really infuses the ice cream with amazing flavor. 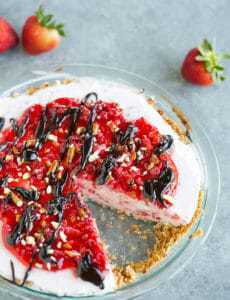 Another perk to the amount of strawberries used is that you are guaranteed many chunks of those juicy red berries with each creamy bite. The strawberries are pulsed in a food processor with a bit of sugar and lemon juice and then left to macerate in the fridge while the ice cream base is made. If you don’t have a food processor, not to worry. You can prepare the strawberries with a potato masher, pastry blender, or even chop them up with a knife. Love this recipe but don’t have an ice cream maker? Head on over to the tutorial about how to make fabulous homemade ice cream without an ice cream maker. Problem solved! 1. Place the strawberries, ¼ cup of the granulated sugar, and the lemon juice in a food processor. Pulse 2 to 3 times, gently mixing after each pulse, so that most of the strawberries are mashed up, with a few larger pieces remaining. Transfer the strawberry mixture to a container and refrigerate for 1 hour. 2. In the meantime, start on the ice cream base. Warm 1 cup of the cream, the milk, the remaining ¾ cup of granulated sugar and the salt in a medium saucepan set over medium-low heat. Once the cream mixture is warmed through and the sugar is dissolved, add the vanilla bean, cover and remove from the heat. Let steep for 30 minutes. 3. Pour the remaining 1 cup heavy cream in a large bowl and set a mesh strainer on top. In a separate medium bowl, whisk together the egg yolks. Slowly pour the warm mixture into the egg yolks, whisking constantly, then scrape the warmed egg yolks back into the saucepan. 4. Stir the mixture constantly over medium heat with a heatproof spatula, scraping the bottom as you stir, until the mixture thickens and coats the spatula (or reaches 170 degrees F on an instant-read thermometer). Pour the custard through the strainer and stir it into the cream, then stir in the vanilla extract. Remove the strawberry mixture from the refrigerator and add it to the cream mixture, stirring to fully combine. Set the bowl in an ice bath and cool to room temperature, stirring occasionally. Once cool, cover and place the mixture in the refrigerator for at least 8 hours (or overnight). 4. Once the mixture is sufficiently chilled, remove the vanilla bean and churn the ice cream according to your ice cream maker's instructions. I love your ice cream recipes!!! I was wondering if I could substitute blackberries for strawberries here and do the rest the same for blackberry ice cream or if there’s something else you’d recommend! Hi Dabney, Thank you! Yes, I think you could substitute blackberries here without a problem. Sounds delish! Do you remove seeds from vanilla bean or put it in whole? Thanks Michelle. Hi Noreen, You put it in whole. You’ll see in step #4, you remove the whole bean before churning the ice cream. Enjoy! Hello, hello! I made this strawberry ice cream with a little addition. At the very end of the churn I added dark chocolate using the Italian technique for stracciatella. It is divine; it’s basically like a chocolate covered strawberry in ice cream form! Thank you for the recipe. It’s great!! I love your vanilla ice cream recipe and it’s always a hit so I was super excited about this one; the flavor was great but the batch I made was fairly icy and the ice cream “crumbled” when we tried to scoop it out of the container. Has this ever happened to you / what should I do differently? Hi Celeste, Oh no! The only thing I can think of is that there was some excess water content in the strawberries. Adding some alcohol to icier ice creams tends to keep them from icing up… you could try that next time! I am not a strawberry ice cream fan and neither is my family. I made this because a friend of the family likes it and I had already made vanilla and chocolate. Everybody liked it and the strawberry fan loved it. He thought it was the best strawberry ice cream and thought I should sell it. He’s going to buy more ingredients for another batch. I thought it tasted extra good in a cone for some reason. Thanks for the recipe. I have a question I see some recipe with eggs and some without what is the different? I jus got my ice cream maker and havn’t use it yet. So I’m asking question first. I see some have to be cooked first and some don’t??? Please help Mr figure this out. The machine I bought only came with 3 recipes and each one is different. I thought you would have something like a basic recipe and just alter it a little for different ingredients but does seem to be the case.???????????? Hi Marie, You can make ice cream recipes with or without eggs, it’s totally up to you. Using eggs results in a softer, creamier, and richer ice cream. Made this ice cream using the non-ice cream maker method because it was too much for my ice cream maker. I also used a combination of frozen and fresh strawberries. Using the freeze and stir method, the results are different – I use a wand mixer to churn, and this means that all the strawberries are pulverized, no strawberry bits left. Also, not sure if by pureeing the ice cream it increased the volume or liquid, but the mixture would not freeze. I started churning every 30 min at 7 PM, and stopped at 11:30 PM because I had to go to bed, but 3/4 of the mixture was still liquid. The result was that the ice cream was more icy/grainy than my other non-ice cream maker attempts. The other comment I have is that there is a step at the end to take the vanilla bean out of the base before churning, but the vanilla bean gets strained out when you strain the mixture, and there is no instruction to put it back in the base. Despite all that, got rave reviews on the ice cream. 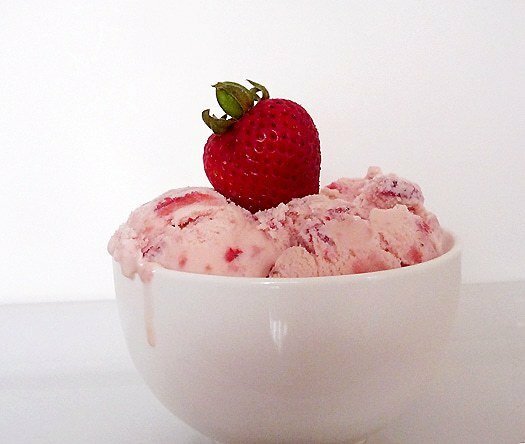 Hi, I just got a request to make strawberry ice cream for a birthday party this weekend – yes, in November. Despite strawberries from South America or whatever, I’m not convinced they would have the fresh strawberry flavor that they would need. Have you ever tried frozen berries? And, if you have, what advice, if any, do you have? I am finding that the frozen berries (w/o sugar added, just whole frozen) are really preferable to out of season berries (and less expensive). Obviously, the composition of a raspberry, for example, will have broken down, but in making a swirl or flavoring an ice cream where you are pulverizing them, it wouldn’t make much difference. Hi Lynne, I think using frozen strawberries that have been thawed and drained would be a fine substitution. thanks for getting back to me so quickly, I am going to use a combo – I found some fresh that have some flavor (but tart! ), so I’m going to use 2c ea. Hey quick question. Does it really have to sit over night. I looked at some of your other recipes and they don’t. It there something special about the strawberry? Hi Lauren, Ideally, your custard should be thoroughly chilled before freezing it in your ice cream maker. Overnight ensures that it gets really cold. Perhaps your refrigerator is kept cold and it might not need that long, but I would be sure to leave it until it is completely chilled to ensure that your ice cream is the best consistency. Okay. This is a good time. Just made a batch and it is divine. I started making this recipe today and realized I didn’t have a vanilla bean. From reading other the comments, I realize I could double the amount of vanilla extract. Should I also skip the step of steeping the vanilla bean in Step 2? Thanks! Hi Megan, If you omit the vanilla bean, I would increase the vanilla extract to 2&frac12; teaspoons. You can also skip steeping the bean, but do make sure you warm the mixture before proceeding with step #3. That’s exactly what I did, and it turned out perfectly! Thanks for a delicious recipe! Found this on pinterest last week, made it for a family dinner (parents & uncle came in town). Anyway, it was fabulous!! My uncles comment was “wow this is the best homemade ice cream I’ve ever had!” Wonderful! Thank you SO much! I’m SO excited I found your blog!! I made this for a family get together. It was my first try at making ice cream with my new kitchen aid attachment, and WOW! The ice cream was out of this world!! A HUGE hit! :) Looking forward to making many more of your ice cream recipes! 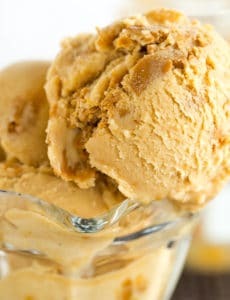 I have made SOOO many of your ice cream recipes and every one a huge hit. Made this one over the weekend and I could not get my grandkids to stop eating the custard! It is delicious! I didn’t have a vanilla bean so doubled the vanilla. I have noticed you reference David Lebowitz’s recipes frequently, but this one couldn’t possibly top his, but I will definitely see if it does. Thanks so much for this! So refreshing. Can’t wait to make it for when all my kids are home Mother’s Day weekend. I feel the same way about strawberry ice-cream LOL… I never did figure out why sounds like your trying to figure out why also. I will be making this and yes with the strawberry ice-cream others like it. I was just wondering if you leave the vanilla bean whole or If you slice it open? Hi Kayleigh, Leave it whole. Just made this last week with fresh from the farmer’s market strawberries. i’m talking strawberries that make the whole kitchen smell wonderful. It was absolutely delicious! I made this tonight. Wow! It is a fantastic recipe! We love it. I even cheated and used 1 tsp vanilla extract instead of a vanilla bean. Still delicious. Thank you for this recipe!